This fire door will close automatically.. This fire door will close automatically. 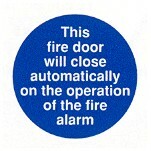 This fire door will close automatically on the operation of the fire alarm.